Update: A stable Oreo ROM for Samsung Galaxy S8 with Snapdragon 835 leaked on Reddit. 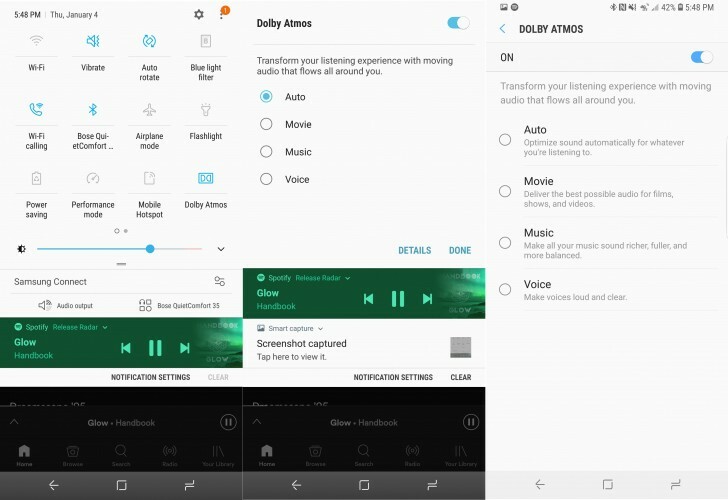 It also revealed that brings Dolby Atmos support will be a part of the release that allows more creative audio tweaking for clearer sound and also comes with the January 2018 security patch. The upgrade can be sideloaded, but it is not yet certified on Google Play and might not support some features, including future updates. The build model number is CRA1 and can be installed if the phone is still on Android Nougat and has the December patch with model number BQL1. Samsung issued the latest Galaxy S8 Oreo Beta version on December 14, where updates featured Bluetooth improvements and plenty of bug fixes. Most recent information on the upcoming upgrade is that Samsung is ending registrations for new users today. The whole program will wrap up in ten days, on January 15. Ending the beta updates for the new OS means Samsung is ready for a public rollout of Android Oreo 8.0. The manufacturer will most likely copy match the timing of last year’s Galaxy S7 Nougat update in the middle of January. The new OS is coming along with a new version of the Samsung Experience user interface. The upgrade will bring app icon badges, detailed control of notifications and history for the search bar in Settings.